After Krawk Island won Altador Cup IV, the classic championship hangover was expected to linger over into Altador Cup V and hold back the powerhouse from greatness. Going simply by how Krawk Island placed, it did. Dasher’s team placed seventh just as Darigan and Haunted Woods did after their championship years. Don’t let Krawk Island fool you though. Seeded sixth going into the finals, Krawk Island beat Darigan, Shenkuu, Roo Island, Lost Desert, and Virtupets during Altador Cup V. KI also had a better yooyuball record than second place Kreludor and was one of the only team to win over 20 games in three of the four AC games. They still had power I believe, it’s just Altador Cup V had a lot of good teams. Chances: Krawk Island is one of those teams I don’t think you’ll ever be able to write off. While it certainly is possible for Krawk Island to win it all if they make the finals, making the finals will not be an easy task. Personally, I have Maraqua, Darigan, and Kreludor already written in on my ‘Top 4’, but as for the fourth team, it’s a toss-up that could easily land favorably for Krawk Island. Chances: Meridell was a yooyuball powerhouse last year; the knights beat every team last year at least once with the exception of Roo Island. Where Meridell falters, of course, is the side games. All three of their side game records are below average for a team that was looking to make the finals. Meridell certainly has potential, but are they spectacular enough to make themselves one of the top four teams in the cup? Every point counts this year for Meridell unless they revamp their side game powers. Any would help really, you can’t have a third tier team (Haunted Woods) do better than you and expect to play for the gold. Lost Desert claimed their gold last year. LD has been eerily consistent through the years in all of their games with the help of their well-structured fan base. That is all in the past now though. They now have to deal with the pressures and doubts that come with being the defending champions. Chances: Defending champions have been doing better and better each year lately, but Lost Desert certainly wasn’t separated from the pack last season (Roo Island had just as many yooyuball points and Darigan had more). Teams are ready to pounce if (and probably when) they slip up. Expect Lost Desert to put up a fight though. Krawk Island was less than one point away from the finals last year. It is possible for a defending champ to make the finals now after all these years. If Hollywood was to make a movie about an Altador Cup team, it would without a doubt be the story of the little team that could: Virtupets. After finishing dead last in Altador Cup II and 14th in Altador Cup III, Virtupets came out of nowhere and dominated SOSD, leaving only two blemishes on what would have been a perfect record. Surely they couldn’t repeat that, right? Yes, they instead went up to sixth place while beating the likes of Darigan, Maraqua, and Meridell in yooyuball. Chances: When suggesting that Virtupets could be trying to make a claim to them playing for the gold, it is kind of hard to take seriously at first. Cellar-dweller Virtupets? In the finals? The thing is though, they’ve earned the right to be discussed. The robots earned more yooyuball points than Kreludor, more SOSD points than Darigan, and more SS and MSN points than Roo Island. You can’t really predict Virtupets this year on anything other than gut feeling. Nothing like this has ever happened in the cup. They’re so small, have risen so much, and have such potential in big games. I have to ask you this though: Has Virtupets done better every year since AC II? Leaving the feel good story, we head to the one that probably made fans cry. Altador Cup V was supposed to be Shenkuu’s year. 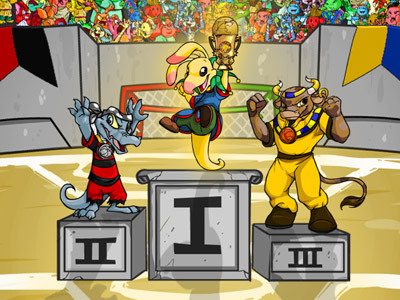 Krawk Island had finally won and had made way for Shenkuu to finally win gold in their fourth trip to the finals. It’s really pretty scary what happened to Shenkuu. Their train really did fly off the tracks and into a wall labeled 11th place. Chances: The good thing about flying off the radar is that nobody really expects anything from you the year after. Shenkuu was carrying the eyes of Neopia in Altador Cup V and can now finally breathe. For the first time ever Shenkuu isn’t returning from a trip to the finals. While Shenkuu doesn’t have any pressure after finishing 11th though, they also still have their potential. We all know the team is capable of being a team playing in the first place match. (I certainly do, being beat up by Shenkuu was a hobby for Kreludor in AC IV.) Of course an 11th place team making the finals is an outside chance, but they do have a chance. After the craziness that we now call Altador Cup V ended, we were left without a real front-runner for winning the cup this summer. With Lost Desert having won AC V, the teams I would call the original powerhouses (LD, KI, RI, and DC) have now all won gold. Someone either now has to step up to the plate and shake things or dare I say even repeat? Of the teams that have yet to win a cup, Kreludor has without a doubt had the most success. Since sitting out in the second cup, Kreludor came back and placed fifth, placed fourth, and won the silver last year. What got them there is their notorious and consistent skills in the side games. Even more importantly though, they can beat you in yooyuball on any given day. With their yooyuball and side game skills put together, Kreludor is a force to be reckoned with in the regular season. What could stop them from winning this coming cup though? In the two years Kreludor has made the final four (first seed both times at that), they have only won one game out of four. I don’t know if it is either Kreludor isn’t/wasn’t motivated or whether the other teams really stepped up their game when it really mattered. Regardless though, they still lost and seem to have a bit of playoff issue. Chances: I would be very shocked to see the purple and orange miss the finals. I would be somewhat surprised to see them win though. Kreludor has had two chances in the finals and has fallen short both times. The new kids on the block of the Altador Cup are lead by Elon Huglis and Maraqua. Maraqua came out of the cellar of forgotten teams and went 13-2-0 in the second of the double robin of Altador Cup IV before placing fifth. The pressure was now on for Altador Cup V. Maraqua was seemingly the trendy pick for the team to make a surprise splash into the finals. They didn’t live up to expectations at first at all, but thanks to another late season dash and a stellar post-season performance again, Maraqua claimed fifth for the second year in a row. Maraqua has two things going for it that every team needs to win the cup. They can play yooyuball and they go crazy in the playoffs (They’ve won all four of their playoff games the past two cups!). What could hurt them? A team like Maraqua can’t have slow starts like those that they did in Altador Cup V. Though the fish did improve their side game skills between AC IV and V, they were still a little lacking. If a team is lacking in side games to begin with and depends upon their yooyuball score, they need every point they can get if they expect to make the finals. Darigan Citadel came roaring back last year. The Altador Cup II champions boasted the cup’s second best yooyuball record (Only behind Maraqua) and fourth best make some noise fan base. DC is a huge team, dedicated, consistent, and is looking for the gold and nothing else. Darigan doesn’t have any one thing you could say would hurt their chances of winning like Maraqua and Kreludor. They have consistency and appear to show up in the playoffs. With DC, it’s more of just a question of will they be able to match the hype they stir up for themselves. Chances: I really like Darigan this year. They appear to have it all; it’s if other teams know they bring the same intensity day after day, can they beat it? Roo Island exploded in the second half of the season last year. After placing a disappointing ninth in Altador Cup IV and looking like they’d have to compete to be able to even make the top eight at the start of the fifth cup, Roo Island stood up and said enough is enough. Lilo’s team went 12-1-2 in yooyuball to close the season. Chances: Roo Island is a powerful force in yooyuball and SOSD and can ride momentum like nobody in the cup, but I think the negatives outweigh the positives right now. They will be skating on thin ice this year and if anything goes wrong look for the ice to crack.